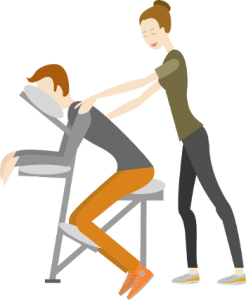 We offer the full range of mobile massage, with or without massage chair, classical or our specialty: The Australian massage. Call us, make an appointment and relax! An experienced massage therapist comes directly to you, to bring you your mobile massage the Düsseldorf office. You de-stress in the company or at the fair. Call us today! who are from dawn to dusk and at night and on weekends at your disposal. Mobile massage in bars found in Dusseldorf regularly Wednesday to Saturdays. Especially in the event area comes neckattack used. How to book us for example for trade fairs, for events or for your office, to be pampered by our team or you and your employees to spendieren a little energy boost.